This set of 8 place card / setting tags compliment the Knitted Noel and Red and White ranges by Talking Tables. 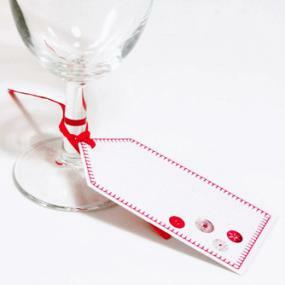 The tags can be tied to napkins or glass stems. They are also ideal tied to guest gifts at each place setting. Each tag measures 9.8cm max x 4.8cm plus ribbon. An added bonus - red and white place tags to match! Great price and speedy delivery. Wd def order again from this website and have already told my friends about So raise your glasses.